Can anyone recommend a Red Cake 5100 substitute that I can purchase here in Blighty? Tomato is a fruit, right? Well it does say something about the only red 'ginny available in the UK. The rest I can't comment on. As a noob, I can't tell if it's a forum wide joke, or a hang up that gets discussed a lot. Not sure if that McConell's tracks with Red Cake, but it's worth a shot. Red Cake is certainly cased as well. I've wondered about the Wessex Red Flake, but that's not a bulk. 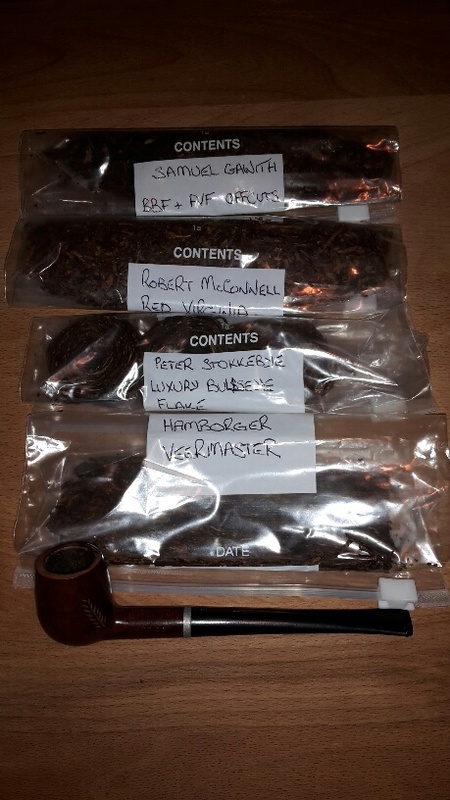 Stick, if you want to try Robert McConnel Red Virginia then PM me your address and I'll send you some. Hey Adam. I've just had a quick read on GQ where it says you can smoke this baccy neat. What do you think mate? How do you like it? This was sent to me by mistake, I'd ordered 3 cans of Scottish Cake but got 2 and one of this. I didn't notice at first (the labels are very similar) and cracked this can first. Was a bit puzzled that the cut was much finer than the Cake but still didn't twig. Then I lit it up and realised something was up. Don't get me wrong, it is a decent tobacco but it isn't Scottish Cake. I din't have any problem smoking it on its own, it's a VaPer with a sweet topping that seems to burn off fairly quickly leaving the Virginia to rule the roost (for me the Perique is only a bit part). My palate is pretty shot owing to ongoing mouth problems but this tobacco seemed to be a reasonable smoke but nothing special. I stuck most of it in a jar so I've got some that's about 6 months old if you want to try it. Very neighbourly of you Adam. Let's hope it ticks all the boxes for our Stick. from what was described on the site it said nothing of ANY Perique being in the blend/mixture, just Red Vas! Straight Red Va's can get a bit sharp at times giving the impression of the sharp tang Perique can exhibit at times so maybe that's waht you were refering to ? There appear to be two Red Virginias made by Kohlhase, Kopp and Co under the Robert McConnell brand as the one I have (and have now sent to Stick) is described on their website as "Reddish Broken Virginia with a hint of Perique". The one in Brewdudes link is the Robert McConnell Red Virginia MC which is the straight virginia with no perique and intended for blending. My mistake, I saw Robert McConnell Red Virginia and went into auto - the MC makes all the difference. As I get most of my tobacco from Germany I ignored the 'access to here in the UK' bit. That explains that tough it won't be ANYWHERE near the same as 5100RC I'd have to say that "hint must be an Imperial form of measure as it's waaaay to imprecise for the Continental Europeans metric system ! Yes, good spot, but I'm still chuffed with the outcome. As Adam points out it'll be a new one on me and I am enjoying my exploration into VaPers also. This thread has also led to me finding a source of straight red 'ginny in the UK too so that's a result too. I must say a big thank you to Adam at this stage for being so kind to help out a fellow BoB brother in Blighty; thanks friend! Nothing to apologise for Wolfman. Well then, there you go David! And do let us know how you get on with the VaPer from Adam, as well as the straight MC whenever you get some in. I'll be interested to see if it's anything like 5100. Crikey Adam, that was quick! a little half sized billiard. Adam, this isn't quite what I signed up for; it appears that you've gone way above and beyond. You've scored a direct hit there old chap. Barring the Veermaster (which I've never heard of) all the samples are on my hit list to try so I'm delighted. And a sneaky little pipe too!! Thank you so much old chap. I'm bowled over! Splendid work Adam. Champion gesture right there an' no mistake!